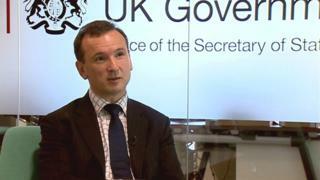 A Plaid Cymru MP has demanded a retraction after Welsh Secretary Alun Cairns said he was "anti-English". The Tory minister made the comment in response to Jonathan Edwards's criticism of his "Western Powerhouse" plan to boost the cross-border economy by abolishing the Severn Bridge tolls. Mr Edwards, who claimed the strategy showed Mr Cairns's disdain for Wales, said the comment was disgraceful. Mr Cairns claimed the MP wanted to deny workers the opportunity of a job. Tolls on the Severn crossings are due to be abolished by the end of the year. The Welsh secretary outlined proposals for a Western Powerhouse strategy at a speech in Newport on Monday. He called for companies in south Wales and the south west of England to pool their expertise. Image caption Jonathan Edwards said it was "not anti-English to want a Welsh-specific economic strategy"
He said: "We need to light the blue touch paper and make a real step change to the way businesses, people and industry from the cities and towns from both sides of the Severn work together when the tolls are removed." Mr Edwards, the Plaid Cymru MP for Carmarthen East and Dinefwr, demanded Mr Cairns "check a map, as the west of our country - the country he is supposed to represent - is nowhere near Bristol and Bath." "Never has the Secretary of State's disdain for Wales been more on show," he said in the Western Mail. "Politicians representing our country should be concentrating on creating a Welsh powerhouse instead of believing that the answer to Wales' problems can only ever come from over the border." Responding on BBC Radio Wales, Mr Cairns said: "Why does he want to deny someone who lives in south east Wales an opportunity to attract investment or an opportunity to work across the border, or an opportunity to attract employment and skills? "Would he show the same attitude if this is a partnership between the south west of Wales and the Republic of Ireland? I suspect not. "I suspect this is more of being anti-English." Mr Edwards later wrote that it was "not anti-English to want to a develop a Welsh-specific economic strategy". In a tweet, he urged Mr Cairns to "retract your disgraceful comments". Speaking to Radio Cymru's Taro'r Post programme, Mr Edwards said the comment was libellous. He said it was "amazing that any politician should accuse another of racism" and accused Mr Cairns of breaching the ministerial code. "Steps will follow on that," he added. Plaid's parliamentary leader Liz Saville Roberts has written to the Prime Minister Theresa May, urging her to reprimand Mr Cairns. A Wales Office source said Mr Cairns would not be retracting the comment. In 2016 Mr Cairns was accused by Plaid Cymru leader Leanne Wood of "peddling smears" about the party on an edition of the BBC's Question Time programme. He had claimed some Plaid Cymru members had broken the law over migration into Welsh-speaking communities. During the fractious exchange with Ms Wood, the Welsh secretary said it "wasn't so long ago" that "cottages were being burned down".